The Journal of Science and Technology of the Arts vol. 8, number 2, has just been published. 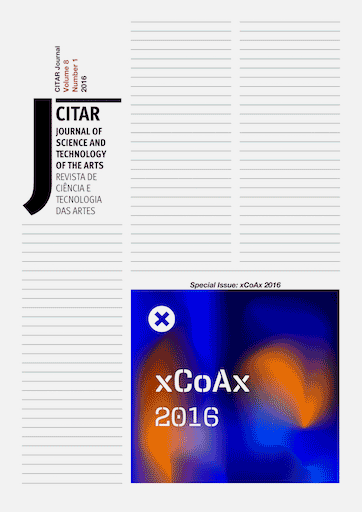 This issue includes a paper by Ricardo Melo and myself, “Regarding Value in Digital Serendipitous Interactions”. Digital technologies have become our privileged method of interacting with information. With their ubiquity, and focus on personalisation, optimisation and functionality, chance and accidental interactions in the Digital Medium are being replaced with filtered, predictable and known ones, limiting the scope of possible user experiences. In order to promote the design of richer experiences that go beyond the functionally-driven paradigm, we propose that digital systems be designed in order to favour serendipity. Through a literature-based analysis of serendipity, we explore the distinct meanings of value that are possible with serendipitous systems, offering examples of the current state of the art, observing the methods used to do so, and proposing a possible typology, while highlighting unexplored fields, experiences and interactions.